Actually, it's another in our series on This Date in Sonic History, and this time we're going back to 1988, an innocent time when million-dollar salaries were crazy talk, and tens of millions of dollars were plenty when you were talking arena construction. And so it was on Monday, February 29, 1988 when the Seattle City Council approved a 30-year agreement with the Sonics for the construction of a new arena located a few blocks south of the Kingdome. The pact called for the city to contribute $1 million a year in admission taxes to go towards paying off the construction debt of the $45(!) million arena. The deal was contingent on the Sonics sticking around for all 30 of those years. At the time, the hope was that the arena would be ready for the 1991-92 season. According to the UPI, the deal had been held up for a period of time due to some councilors' objection to the level of municipal involvement in the otherwise private project and because of the impact the new arena would have on the Coliseum (sound familiar, gang? ), but that rancor was subdued when the terms were adjusted to be more favorable to the city should the Coliseum be forced to close its doors. The arena, which was to hold between 18,000 and 19,000 fans (various reports had it pegged at various numbers), was, of course, never built, but the what ifs will ring in perpetuity. Ackerley claimed he would honor the 30-year agreement, and it's possible that he would have honored that promise, meaning the team would only now be looking at renovating the facility. Of course, America's cemeteries are full of dead arenas (Charlotte, Orlando, Cleveland, etc.) that were built in Bush the Elder's presidency, only to be rendered obsolete by the time his son took office. Is that what would have happened in Seattle, too? Impossible to say, but worth thinking about on another cold winter day in Seattle. (Gathered from here and here). Can you name the six players who have held the title as all-time leading scorer in Sonic history? (Answer below. Also, a sidebar: Assume for the sake of brevity that the all-time leading scorer race commenced at the end of the inaugural 1968-69 season; otherwise, we wind up with a dozen guys from the first season jockeying for first place and it becomes a jumbled mess). To help you in your decision-making, recall that on Feb. 26, 1978, Fred Brown became the leading scorer in Sonic history, passing Spencer Haywood's old record of 8,131 points. Brown tallied 32 points as the Sonics edged Philadelphia 99-97 in a come from behind victory. Of note, Coach Lenny Wilkens was ejected for arguing with officials ("I guess I lost my head," the normally placid Wilkens said after the game), the first time in his career (playing and coaching) that he had ever received that dubious honor. Also of note, Philly Coach Billy Cunningham received the heave-ho as well. Brown provided the winning score with 18 seconds left on the clock just as the 24-second clock was about to expire, helping the Sonics eliminate what had been a 16-point third quarter deficit. The Sixers had three chances to tie the game in the closing moments, but Doug Collins (! 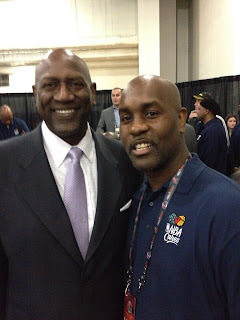 ), Daryl Dawkins (!! ), and Julius Erving (!!!) all came up short. And now, in case you couldn't come up with the six, here's a handy-dandy graphic with all the details. That's Walt Hazzard, Bob Rule, Lenny Wilkens, Spencer Haywood, Fred Brown, and Gary Payton, in case you couldn't gather from the photos. Happy birthday to the great Julius Erving. 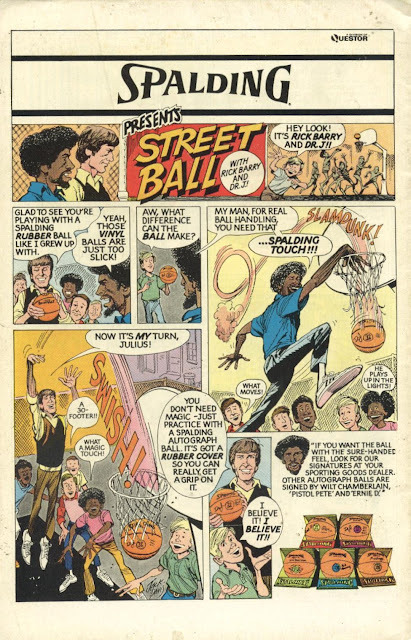 May you never lose that magic SPALDING TOUCH!!! When I first heard about the Houston/Sacramento trade involving Thomas Robinson, I couldn't help but think of another trade involving a team expected to be relocating in the near future. 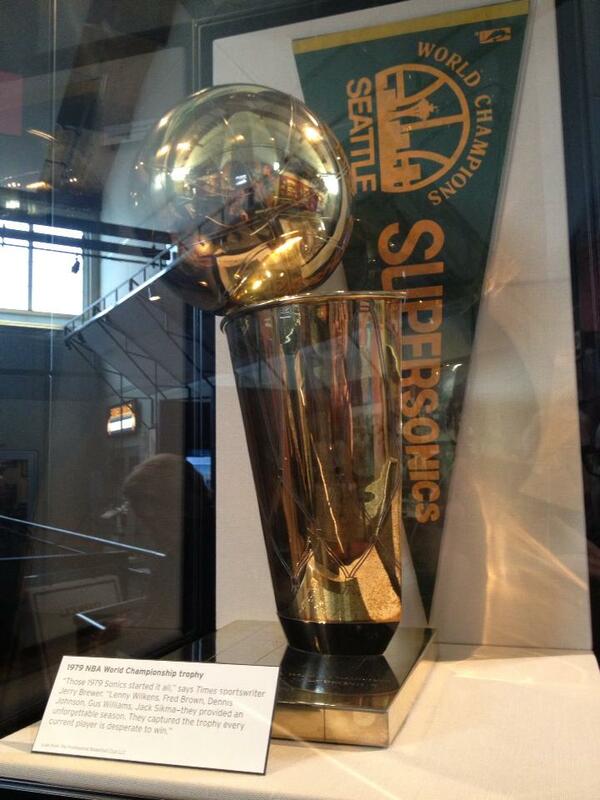 It was February 21, 2008, and the Sonics were throwing valuables out the window at a cops-are-coming pace. The reader must remember that in mid-February 2008, the only decent offensive option for Seattle other than Kevin Durant was Szczerbiak, and by trading him the team was essentially saying that even though Szczerbiak's expiring contract was valuable, they were more interested in paring salary than anything else. It was, of course, a logical choice to make, and one that only a team utterly disinterested in fielding a competitive team could make. And so it was that the Sonics surrendered Szcerbiak and Delonte West and received in return, Ira Newble (! ), Donyell Marshall (!! ), and Adrian Griffin (!!! ), who would, of course, go on to score a combined 24 points in the remainder of their collective careers. "Absolutely not," Presti said. "Clay has been tremendously supportive of our decision making on the basketball side." In his book Tales From the Seattle SuperSonics, Slick Watts (and co-auther Frank Hughes) go into great detail about Watts' sometimes-good, sometimes-not-so-good relationship with the great Bill Russell. "When we played Boston, I thought Russell became the best coach in the world. For some reason, he prepared us well to play Boston. He said the game didn't mean anything to him, but for some reason we always played well. And he would come into the locker room pleased whenever we beat Boston." Entering the 1974-75 season, the Sonics had existed for nearly a decade and had yet to reach the playoffs. The Celtics, meanwhile, had a vacation home in the NBA Finals and were the defending NBA Champions. Featuring John Havlicek, Dave Cowens, Paul Silas, Jo Jo White, Paul Westphal, and others, they were in another universe when compared to the Sonics. And so it was, that on Feb. 19, 1975, the Sonics played host to the Celtics. At 27-31, the Sonics were coming off a surprising win over the Lakers the previous night, but they still figured to be no match for the 41-17 Celtics - a team that had won 11 in a row earlier in the month, and had won 22 of their previous 25 games on the year. Clearly, anyone could see that the Sonics were being prepped for the slaughterhouse. Anyone, that is, except Bill Russell. Who knows what Russ told his young team before the game started. Perhaps he threw up in a bucket; maybe he threatened them with a baseball bat. Whatever it was ... it didn't work. Seriously, after one period of play, the Celtics were rolling, leading the Sonics by a comfortable 33-19 margin en route to another win. 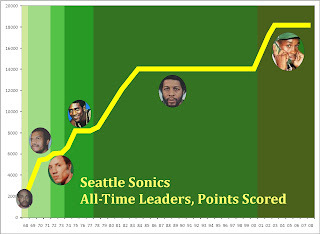 Somehow, though, the Sonics came alive. Buoyed by a standout performance from big man Tom Burleson (who would go on to score a career high 28 points on the night), Seattle roared back to take a 4-point halftime lead - helped in no small part by a 17-0 run during the quarter - then build upon that with a ridiculous 35-14 edge in the third quarter on the way to a 26-point win over the defending NBA Champion Boston Celtics! "They smoked us." Boston Coach Tom Heinsohn told the AP. "It was their night." Even the noted begrudger of popular sentiment, Bill Russell, had to concur. "It might be our best game of the year," Russell said afterwards, while no doubt dancing a jig on the inside. Stranger still, Russell had used an incredible four rookies - Burleson, Rod Derline, Tal Skinner, Leonard Gray - and a second-year player (Watts) for a large portion of the second half. It was a remarkable performance, and a turning point in the season for the green and gold. 27-31 entering play that Wednesday night, the Sonics caught fire and went 16-8 the rest of the way, including a 7-game win streak to close the season. The momentum carried into the playoffs, where they knocked off the Pistons in Seattle's inaugural playoff appearance, and took a 2-2 split before losing to eventual NBA Champion Golden State in the second round. The 1976-77 season was one of the more unusual in the team's history - featuring the end of the line for both Hall of Fame Coach Bill Russell and popular point guard Slick Watts. Unlike Russell, Watts wouldn't leave the team until the next season, but his future in Seattle took a inauspicious turn on Friday, February 18, 1977 when he unloaded his frustration about a perceived lack of fair compensation to the local media. The Sonics were on the road that Friday, and while the on-court results were positive (Slick led the club with 19 points in a win over the New York Nets), Watts used the opportunity to explain that he wanted to be traded - and, boy the Nets and Tiny Archibald sure looked like a great place. "I've got to get what I'm worth," Watts told a reporter. 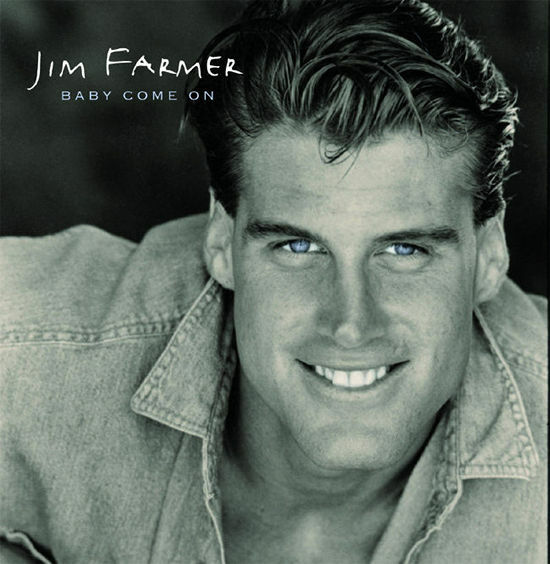 "I play hard and I do the dirty work and for doin' the dirty work I want to get compensated.... There's seven players on the Sonics makin' more money than I do." It's easy in 2013 to underestimate how popular Watts was in Seattle in the mid-1970s. 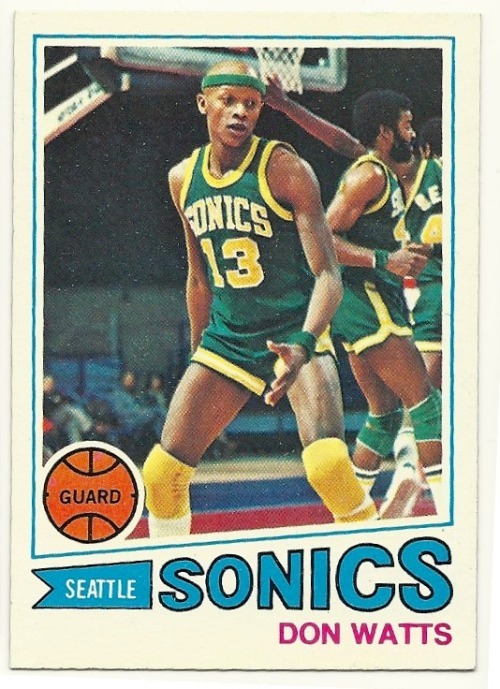 Prior to the arrival of the Seahawks and Mariners, Sonic basketball was the only professional entity in the state, and Watts - with his exuberant personality, cocked headband, and exciting play - was the most famous player on the roster. 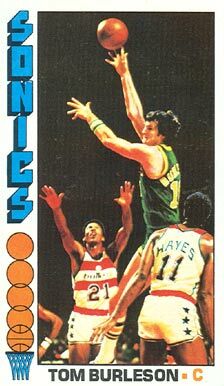 With hundreds of personal appearances a year, Watts was the Sonics. And yet, his salary didn't reflect it. At $90,000 a year, Watts was making less than such players as Tom Burleson ($310,000), Fred Brown ($200,000) and - worse - Frank Oleynick ($100,000). When Watts injured his knee during the season he suddenly became aware of his basketball mortality, and how close he was to going from Slick Watts, Basketball Player, to Slick Watts, Insurance Salesman. With that in his head, it didn't take much for Watts to spill his guts to PI reporter Blaine Johnson. Watts' comments didn't help matters. His new contract - which he hoped would earn him in excess of $200,000 year - never came off, and Watts wound up being dealt to New Orleans for a first round draft choice in the fall of 1977. It was a shocking transformation for the poster boy of Seattle basketball. Feb. 18, 1977 - the beginning of the end of the Slick Watts Era. 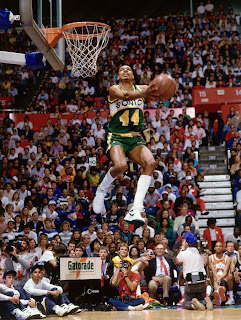 In honor of tonight's dunk contest, here's arguably the greatest dunker (non-Shawn Kemp division) in Sonic history, Terence Stansbury, competing in the 1987 Slam Dunk Contest. Statue of Liberty, here we come. 22 years ago today, the Sonics and the Milwaukee Bucks did what all teams do when they have disagreeable superstars – they swapped them. And so it was that Ricky Pierce and Dale Ellis – two of the shootin’-est shooting guards in NBA history – wound up trading uniforms on February 15, 1991 in a straight-up, no-blinking trade that seemed more at home in a fantasy league than in a real one. The reasons for the trade were, naturally, both financial and emotional. Per The Seattle Times, Ellis had become dissatisfied with his usage under new coach KC Jones, while Pierce was frustrated with Milwaukee’s foot-dragging in contract negotiations. (Want to feel old? Try this on for size – Pierce’s deal was for $1 million a year. He was looking for something north of $2 million.). With the benefit of hindsight, we can attempt to figure out who won the deal. Oddly, even though I’ve always assumed the opposite, Pierce wasn’t that much older than Ellis (perhaps it’s because Ricky Pierce was already 31 when he was born). In any event, neither player wound up lasting too long in their new homes. By 1992, Ellis had been dealt to San Antonio, while Pierce lasted until 1994 before being traded to Golden State. Pierce – famously – bickered with new star Gary Payton during the infamous Denver Nugget Debacle in the 1994 playoffs, a not insignificant coincidence with his trade later that summer. It’s difficult to say who’s valuation was higher. Sarunas was coming off consecutive 17+ ppg seasons, but Rogers was an 11th overall pick that helped to sweeten the deal. 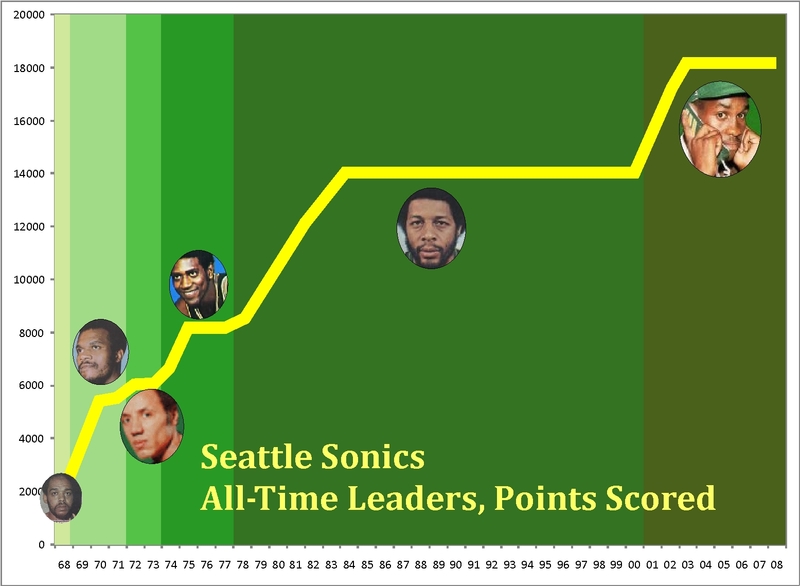 Statistically speaking, both players enjoyed long and productive careers, with Ellis even returning to Seattle nearly a decade later (and leading the league in 3-point percentage at the ripe old age of 37!). Ellis gets a slight edge, but a chunk of that gets erased by the fact he played an extra season relative to Pierce. In all honesty, both players contributed at high levels immediately after the trade, and while Ellis’ numbers were slightly higher, that could be balanced by the fact Pierce started more playoff games in one season (1993) than Ellis did in the entirety of his post-trade career. 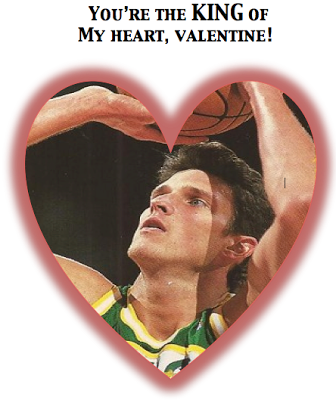 So our vintage obscure Seattle Supersonics valentines weren't romantic enough for you, eh? Well here's something for that will knock your green yellow socks off: The official website of former Sonic and eternal heartthrob Jim Farmer, who apparently is now some sort of model and/or country singer. Warning: his manliness may melt your computer screen, so watch out! After spending a day rummaging through the Supersonicsoul video archives (my spider-ridden garage), I found this gem from 1990. It's from a Seattle Supersonics infomercial called "Sonics Slam Dunk Saturday" that featured clips from the 1989-90 Sonics and a preview of the upcoming 90-91 season, including pieces on new coach K.C. Jones (who would be fired the following season) and an exciting new rookie named Gary Payton. The most interesting part of the show, however, was an in-depth look at the new Seattle Arena that was to be built next to the Kingdome. Who wants to call that number and reserve some luxury boxes? The show, hosted by a mustached Kevin Calabro and sportscaster turned Sonics salesman Gary Spinell, was about two hours and the source material (a well-worn VHS tape that's probably full of spiders or baby rats) is not great, but I'll be posting the best parts to our new YouTube Channel, SupersonicsoulTV, so be sure to subscribe to get updates. Now if you'll excuse me, I have to take about a thousand showers. SPIDERS! This plan not only served as a basketball arena, but also an Imperial Shuttle for Darth Vader. As Seattle and Sacramento both ramp up plans to build new NBA arenas, it's easy to forget how many times we've been down this road before. After all, Seattle is a town lousy with failed dreams and broken promises. From an extended monorail to a refurbished waterfront, we have rarely seen a good plan that wasn't worth killing with fire. The Sonics have an especially bleak history of unfulfilled plans. During their 41 year residency, the Supes were often basketball vagabonds, couch surfing around the Puget Sound with stops at the old Coliseum, the Kingdome, the Tacoma Dome and even Hec Edmundson Pavilion, an old gym even too small for the University of Washington Huskies. Fed up with the leaky roof and meager seating of their Seattle Center digs in the late 80s, former owner Barry Ackerley came close to sealing a deal for a new stadium. SeaFirst Arena of Seattle was to be built near the Kingdome and, like the current stadium plan, got the approval of the City Council before getting derailed by a parking dispute with (you guessed it) the Mariners. Ackerley was so frustrated by the lack of progress that he officially filed for relocation in 1990. Luckily, cooler heads prevailed and Ackerley finally settled for a refurbished Coliseum, sparing us the indignity of watching the Kemp/Payton era unfold with the San Diego Sonics (shudder). Another forgotten arena aberration took place more recently. In 2008, we were all going a little crazy about our team getting hijacked. And none went crazier than Seattle Supersonics legend Downtown Freddie Brown, who proposed one of the most ambitious/insane/awesome arena plans in the history of anything. This thing had everything. An interchangeable basketball/hockey court, retractable roof, waterfront view and, of yeah, it only cost ONE BILLION DOLLARS! Sure, this place was total vaporware and had zero chance of ever being built, but can you imagine how awesome it would have been to see Squatch waterskiing in Puget Sound during halftime or Danny Fortson paragliding off a ferry onto the court before every game? But alas, this was yet another Seattle sports pipe dream. 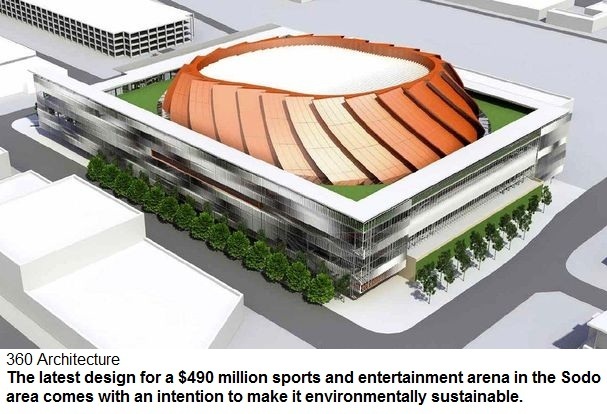 And like Ackerley's arena before it, it serves as a warning to desperate fans in Seattle and Sacramento: don't count your weird, bundt cake-shaped arena before it's built. According to ESPN, AP and that David Stern guy, the Chris Hansen/Steve Ballmer group (or HAN-BALL, as I like to call them) has officially filed to relocate the Sacramento Kings to Seattle. As a Sonics fan, I should be ecstatic right now. But I can't help but remember the sickening gut punch we all received back in 2008 when the same thing happened to us. My sincere best wishes to our friends in Sacramento and here's hoping all this drama will lead to new, less crazy owners for the Kings and a shiny new expansion team for Seattle. If you are a Sonic fan (and, no, I’m not sure what that means anymore, either), you’re undoubtedly aware that Gary Payton has been nominated for – and will almost undoubtedly win election to - the Basketball Hall of Fame. Loyal readers might recall a couple of articles we ran that attempted to decide whether specific players (Spencer Haywood and Jack Sikma) were logical candidates for the Hall. The articles were based on Bill James’ Keltner List (Basketball-Reference should also get credit for this idea; they’ve done it with dozens if not hundreds of players). The whole endeavor left me a little cold, if only because the Basketball Hall of Fame is not like the Baseball Hall of Fame. It’s a bizarre, illogical stew of mismatched ingredients; a few potatoes here, a couple shrimp there, and, hey, let’s throw some brussel sprouts in because, why, well not? Put it another way: The Baseball HOF makes (some) sense, and a coherent line of questioning can lead you to an answer to the ultimate question: Is Player X a Hall of Famer? The Basketball HOF, though, is a mess, and needs a completely different line of questioning. But enough of my rambling. On to the questions! Is Gary Payton a Hall of Famer? Was he ever regarded as the best player in basketball? No, although he was probably considered the second- or third-best player in the league in the mid-90s and there is no shame in being second to the best player in history. Was he the best player on his team? Absolutely, for many years. Did he play for the Celtics? Yes, Payton played briefly … um, what does this have to do with anything? Did he play for the Knicks? Did he win a championship with the Knicks? No, he never played for the Knicks. Did he ever win a Cup? Perhaps a Spangler Cup? Or a Macedonian Elite League Cup? What? He played in the NBA Finals three times and won it once. Is that what you mean? Is he Brazilian? Did he ever score 40 points in a meaningless exhibition game while taking more than 30 shots? No, and this whole process is really starting to bug me. Did he dominate at the collegiate level in a small sample size and then fail to replicate that success at the professional level in a larger sample size, but we really liked rooting for him in college, and geez, wasn’t it great when the Big East really mattered? Yeah, that’s a no. He was really good at Oregon State, though. Did he play for perhaps Fort Wayne or Tri-Cities? Are you kidding with this? Are you sure he didn’t play with the Knicks? I think I’ve had enough. Hey, remember when we tried to nominate Yao Ming less than a year after he retired and even he thought it was a dumb idea? Wasn’t that kind of silly? Yeah, I guess that’s one way of describing it. 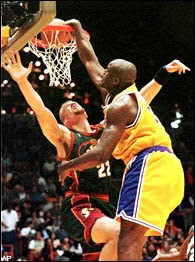 Wait, what does this have to do with Gary Payton? Was he a skinflint owner whose only real contribution to the game was selling his team to somebody else 30 years later and making a huge profit? Not really, no. Actually, we’re not really interested in Seattle and Portland, unless they played in the 70s, and even then, not so much. Seriously, go screw yourself. With San Francisco coming oh so close to winning the Super Bowl on Sunday, 49ers fans are going through the same emotional torment that Seattle Supersonics fans suffer through on a daily basis: the dreaded What If Syndrome. What if they avoided that costly illegal formation penalty on the first play of the game? What if the offense had shown up in the first half? What if the power never came back on? As a lifelong Sonics fan, I have spent most of my life going through this sort of masochistic mental torture. What if Nate McMillan had stayed in 2004? What if Steve Ballmer had bought the team in 2001 instead of Howard Schultz? What if Jim McIlvaine had never been born? Dwelling on these dark thoughts is, of course, pointless. Time is linear. It moves on, with or without you. And yet, for many sports fans, there is a tiny room in the back of the mind that stores a terrible, horrible device that keeps track of this sort of thing: The What If Machine. Its sole purpose is to examine crucial points in time and pinpoint the exact crossroad that led to the team bus driving off the cliff. 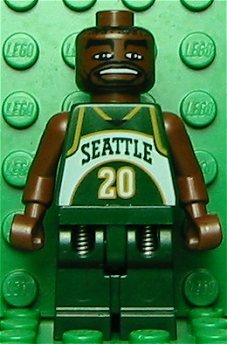 It's hard to imagine, but back in '07, most of us in Seattle were praying that we'd somehow get Oden. At the time, he was seen as the second coming of Bill Russell. Despite the long history of number one picks tanking and the fact that Oden's bones were apparently made out of paper mache, the mystique that comes with a top draft pick is undeniable. It might have, at least momentarily, galvanized the community to fight harder to keep the Sonics in town. 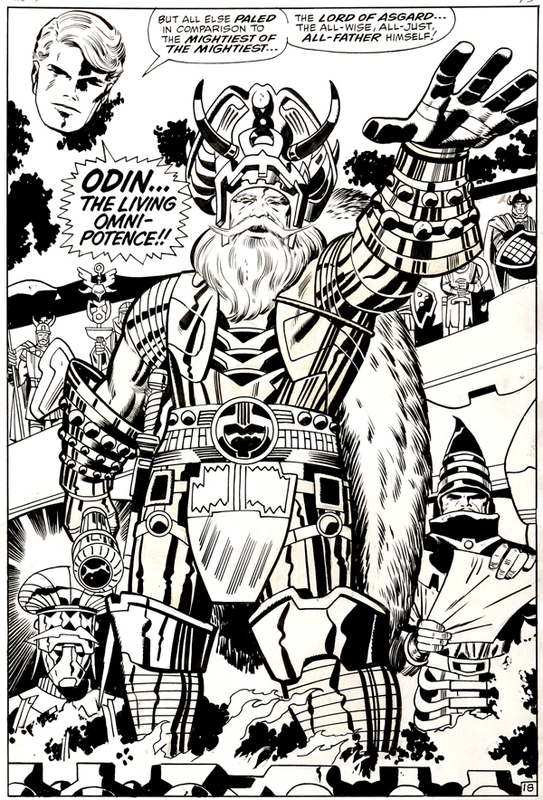 At the very least, Ballard would have been ecstatic about having a guy (almost) named after Thor's dad. More importantly, He Who Must Not Be Named would still be playing in the Northwest, wiping Sam Bowie from Portland's own What If Machine, while Mr. Eggshells For Bones would be on the Permanently Too Fragile To Play List for a very mediocre midwest team that no one cared about. But, like the Mirror of Erised, spending too much time with the What If Machine will lead to madness. Dwelling in the past is the ultimate act of futility. Kind of like cheering for a professional sports team.